By now most of you probably know that I rarely give a straight answer to your questions or tell you what you should do. Some of you have teased me about that. A few of you have complained about it. Either way you are right. I don’t often give straight answers in my preaching, teaching, or spiritual direction; or at least I try not to. And the reason I don’t do that is because I don’t think the gospel does that. Rarely does the gospel tell us what to do or believe. Rarely does it give us a straight answer. And today’s gospel (Luke 24:13-35), the road to Emmaus story, is no different. It doesn’t give us answers. It raises questions and invites reflection. It’s a map by which we orient and find ourselves. It reveals intersections of Jesus’ life and our lives. It begs to be recognized as a story about our lives, and it is a story with which we are familiar. It is a story of shattering and restoration. If your life has ever been shattered then this is your story. If your life has ever been restored then this is your story. And if you’ve ever been in that in between place, between shattering and restoration, then this is your story. Within this story is a pattern or template that describes the journey from Jerusalem to Emmaus and back to Jerusalem. It’s a journey Cleopas and his companion take and it’s a journey each of us has taken, is taking, or will take. It’s not, however, a one time journey. It’s a journey we take again and again. I am not talking about Jerusalem and Emmaus as particular geographical locations. I am talking about them as archetypal realities. They are portals into a greater self-awareness and apertures through which we see a greater fullness of God, ourselves, each other, and the world. There is a Jerusalem within us and an Emmaus within us, and both get enacted in our lives. That’s also true for the breaking of the bread. It also is archetypal. It might point to and remind us of the Eucharist but the Eucharistic reality is bigger and more expansive than what we do here on Sunday mornings. Have you ever felt like you just had to get away? Or felt like life had given you more than you could handle? Have you ever run away from life? Have you ever been deeply disappointed? Have you lived with unmet expectations? When have you felt lost, as if your world had been turned upside down? Have you ever wrestled with those big questions: “Who am I now? What’s next? Where do I go? What do I do?” Can you remember a time when you did everything right and life still didn’t work out the way you planned or wanted? Have you grieved the death of a loved one, a dream, an identity, a future? Has your life ever been shattered? If so, then you know what it’s like to be Cleopas and his companion. 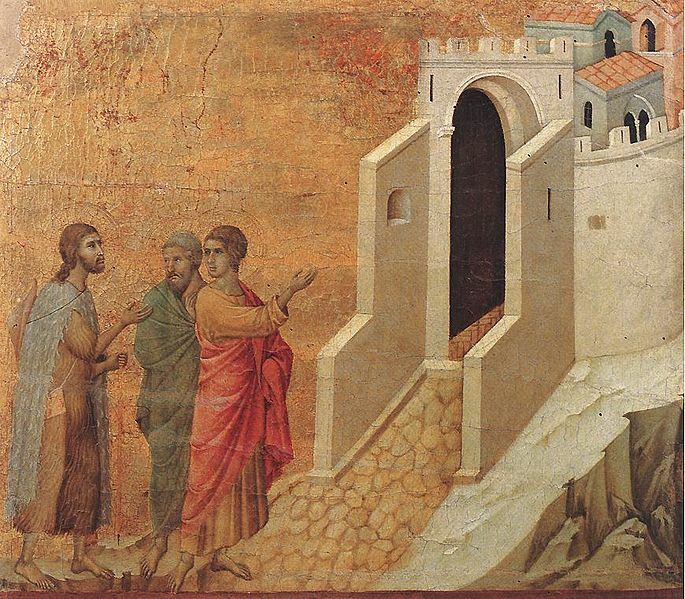 It’s Easter morning and the two disciples are leaving Jerusalem. Who can blame them? Jerusalem is a place of pain, sorrow, and loss. It’s a place of death, unmet expectations, and disappointment. It’s a place where their lives were shattered. No one wants to stay in that place. I sure don’t, do you? As they walk they are talking about all the things that happened, and, I suspect, all the things that didn’t happen. They are talking about Jesus’ arrest, torture, crucifixion, and death. They are taking about hope that didn’t materialize, expectations that were unmet, investments that paid no return. They are disappointed and sad. They had hoped Jesus was the one, but he’s dead. And there’s a part of them that’s been lost, a part of them that died with Jesus. They had heard rumors that he was alive but it all sounded like an “idle tale” (Luke 24:11). There was nothing to keep them in Jerusalem. Their lives had been shattered. I don’t know why they chose to go to Emmaus, but I’ve known times when I just wanted to get away, when any place was better than where I was. Any place would be better than Jerusalem. Emmaus is our escape from life. Or so we think. What we don’t know at the time, and what Cleopas and his companion did not know, is that it is also the way back to life. That realization happened for the two disciples, as it does for us, in the breaking of the bread. It wasn’t an escape from life that took them to Emmaus, but a hunger for life. It wasn’t brokenness that took them to Emmaus but a hunger for wholeness. It wasn’t a shattering that took them to Emmaus, but a hunger for restoration. Hunger is more than physical, it also spiritual and emotional. We are by nature hungry. We hunger for life, love, wholeness, community, meaning, purpose. That hunger is surely the reason they strongly urged Jesus, “Stay with us.” Jesus would not only stay, he would feed them. The guest they invited to their table would become their host. “When [Jesus] was at the table with them, he took bread, blessed and broke it, and gave it to them. Then their eyes were opened, and they recognized him.” They recognized him as the one they had left for dead in Jerusalem. They recognized him as the one who had accompanied them on the road to Emmaus. They recognized him as the one they had hoped he would be. Jesus wasn’t just giving them bread, he was giving them back themselves. This was their restoration. When Jesus broke the bread something in them broke open. With that breaking open their lives were being put back together. So it is for us as well. We’ve all had times when out lives were broken open in ways we could never imagine or have done for ourselves. Despite how it feels, our brokenness is not an ending. There is more to it than we often see or know. It is not just brokenness, a shattering, it is a breaking open to new life, to new seeing, to new recognition, to community, welcome, hospitality, and love. Isn’t that why we gather around the table every Sunday? Isn’t that our unspoken desire for the meals we share with each other? Where do you think he went? Was he abandoning them? Was he playing games with them, “Now you see me, now you don’t?” Was he undoing everything that just happened? No. It wasn’t anything like that. He was no longer before them because he was now within them. Jesus was the burning heart within them, and it had been there all along. Sometimes that burning is felt as brokenness, sometimes as hunger, or being broken open, and other times as deep joy and gratitude. Always, it is Jesus. They returned to the place from which they had to get away. Jerusalem is not only the place of death it is also the place of life. It is not only a place of sorrow, it is a place of joy. It is not only a place of shattering, it is a place of restoration. Cleopas and his companion arrive with news of their Emmaus experience only to hear that Jesus was alive, seen, and present in Jerusalem. We leave Jerusalem in order to return to Jerusalem: to face our deaths, losses, and shattered lives. In so doing we discover that life awaits us. We return to reclaim ourselves, to recover the lost pieces of ourselves. The city hasn’t changed but we have. Shattered lives, broken bread, restored lives. Jerusalem, Emmaus, Jerusalem. That seems to be the pattern. It’s never, however, as simple or easy as it sounds. It’s one thing to name the pattern but another to live it. It takes time and effort. It’s not easy and it’s painful. It means trusting that somehow the shards of our lives will become the pieces for a new life, a new seeing, a new way of living. Given where I started this sermon you won’t be too surprised when I say that I have no answer for you. I am not going to tell you what to do. Instead, I have some questions. Where do you see this pattern in your life? How have you experienced it? Are you leaving Jerusalem? In Emmaus? On the way? Returning to Jerusalem? In what ways has your life been shattered? Is it in pieces today? What are you running from today? This moment? What is your deepest hunger? What are you running toward? What is your Jerusalem today? Is it a place of sorrow and loss or is it a place of life and restoration? Where is your Emmaus? What do you need from Emmaus today? How do you imagine the lives of these two disciples to now be different? How would you like your life to be different? What today in your life is being broken open? What needs to be broken open? What in you, in your present circumstances, is being or needs to be restored and put back together? There are no right or wrong answers to those questions. There is only your answer. Whatever your answers may be they describe the intersection of Jesus’ life and your life. Shattering, breaking open, and restoring are all places of that intersection. They were for the two disciples in today’s gospel and they are for us as well. Jesus was in Jerusalem before Cleopas and his companion ever left. He was with them on the road to Emmaus. He was in the breaking of the bread. And he was already in Jerusalem when they returned. Do you know what those intersections are called? They are called the gifts of God for the people of God. From the time in high school when I publicly acknowledged my call to the ministry, until my senior year at Hardin-Simmons, I somehow felt I had to answer any and all matters. Nobody ever told me that, but it was my impression as I watched most preachers. Then, in my senior year at H-SU, I was greatly relieved when I took a course in counseling emphasizing Carl Rogers’s non-directive counseling: I didn’t have all the answers, and I didn’t need to try to give them. You don’t have all the answers, but your questions always help me see things in a different light as I puzzle on my way to Emmaus or back toward Jerusalem. I am continually working on this. What to do? What is the answer? Those are my defaults. It is a heavy burden to have to have all the answers. And even if I thought I had them my answers can’t be some one else’s answers. Questions, I think, will take us further than do the answers. Peace be with you Lawrence. I have ever been impatient, which has caused numerous delays and consequences and often sent me running off to Emmaus in search of answers. On the other hand, I’ve learned from those consequences. Sometimes my road to Emmaus has been extreme: a weekend at a monastery or somewhere similar. Christ in the Desert in Abiquiu was the most memorable. Every time the rebound is shorter – last time (Monday, April 24, I referred to in another post) the rebound was 24 hours. Earlier it’s been weeks, months, and long ago – years, agonizing over things, wrapped up in (and enjoying / perpetuating) the drama. Finally I seem to be learning (the hard way) to understand acceptance, faith, allowance, and not assume that circumstances – whatever they are – mean “bad,” or “lacking” or that I have to fight whatever it is that’s taking place or run from it He’s always there. He’s there in what may appear to be bad, but isn’t (unless I choose to name it so). He’s there when I run “to” and when I return “from.” He’s there in what I didn’t see and in what I learned from the not seeing. He’s just always there. Wherever I am, in whatever I’m doing or thinking or choosing or being. That makes it a lot easier to be where I am. Your 3-part series has given me additional insight and understanding. I’m thankful for that. Thanks for your comment Judi. I am glad the sermon offered you some additional insights and understanding. What you describe sounds to me like practicing resurrection. Wonderful reflections Michael . . . .
. . . on the Journey to Emmaus. I have always loved this story but much of it has puzzled me. When Jesus joined the couple on their way to Emmaus he was silent as to his identity. He listened to their tale of sorrow and grief but never once countered with the reality of his resurrection. Fresh from his three days in the tomb Jesus strikes me as buoyant and perky. On the road again. I suspect Jesus never announced who he was because he waits for us to see him. Your reflections and questions confirm my hunch as to how he operates. Thank you so much for your comment and insights. I agree with what you say. It’s not so much about an announcement from him as it is about our awakening and seeing. Thank you for this reflection. After reading your thoughts, I sat a while with the story. What strikes me is how often I am like the two on their journey…God’s Presence is always with me but most of the time I am blind to it….not seeing anything but the “obvious” of life around me. Even when I have an inking of Presence (my heart burns within me), I get distracted by the events of the day, the news, the horrible things the power brokers of “the world” do. The other aspect of the story that became insightful was that Jesus only ate/broke bread with the travelers after they urged him “strongly” to join them. He did not force his company on them nor did he offer much except a listening ear until they were willing to open themselves to his presence. And, it was on their initiation, the opening of their hearts, that allowed this to happen. Only then did he share with them. What might have happened if they had not invited him? Diana, I really appreciate your insights. I hear you describing an interiority – seeing with the eyes of the heart and experiencing our deep hunger. When I lose that interior aspect I am blinded by distractions and try to be self-sufficient. Sadly the system is not allowing me to ‘like’ this wonderful article, but I would like to express how much I enjoyed reading this piece and its beautiful message. With every word of this sermon you spoke to me. My life has been shattered and I want to escape the pain by going somewhere, anywhere to leave Jerusalem. I have been so immersed in grief and trying to figure out the “why” that I sometimes forget that God’s love and guidance is with me wherever I am. It is a long and difficult journey to Emmaus and back, but I will keep trying. Along the way I must concentrate on Dan’s life rather than his death with gratitude and knowledge that to love deeply is to suffer deeply when death occurs. Gary and I are fortunate to be surrounded by the love and support of our St. Philip’s family, our friends, neighbors and family and your love and guidance. As you have taught us, we see Jesus every day in these faces and it sustains us through the darkness into light. Beverly, I suspect that your “figuring out the ‘why'” is what Cleopas and his friend were doing as they walked and were “talking with each other about all these things that had happened.” What we often don’t know is that Jesus is a silent partner in those conversations. He is present but makes room for our grief and loss. And yes, the journey to Emmaus and back is long and difficult. When it comes to grief there are no shortcuts. What we need are good traveling companions. We love you and Gary.